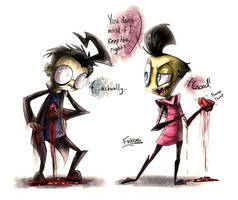 for all fans of ZADR, which is the shipping of zim and dib. you may use this. Late as hell to comment but goddamn this button is perfect for a ZADR shipper like me. This is honestly one of my favorite ships. And y' know, one of my favorite comics. I AM A ZADR FAN!!!! I absolutely adore zadr so good gob. God I Love Your Work!